Suppose you plan to apply to business school and therefore have to take the GMAT. Suppose you bid a less-than-fond farewell to math at the end of, say, Algebra II, back in your salad days, and you haven’t given an iota of thought to mathematics since then. Now, you’re staring the GMAT in the face and you’ve got no idea how to study for GMAT math. Well let’s start with the basics. First, know the structure. 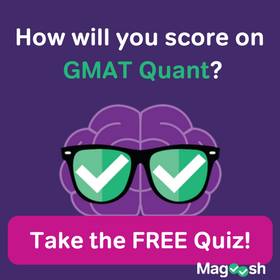 On the GMAT, one section will be a 75-minute Quantitative section, and on this section, you will see 37 questions. 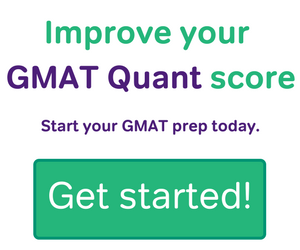 As with all questions on the GMAT, once you answer a question, you can’t go back to it, because both the Quantitative and Verbal sections are Computer Adaptive: you will get harder or easier questions, depending on whether your previous answers were right or wrong. There are two math question formats on Quantitative section. The first format, Problem Solving (PS), is just the same old five-answer multiple choice format you have seen on every standardized test since before puberty. This question format needs no special explanation. The other format, though, Data Sufficiency (DS)–this is a beast unique to the GMAT math section. This question format has unique rules, so it necessarily demands unique strategies. I can’t emphasis how important this is to learn when you are studying for math on the GMAT. When you study for GMAT math, it’s vitally important to know what math content the GMAT tests. Check out our post that summarizes the breakdown of GMAT math concepts by frequency. The single most-tested math concepts are number properties. It’s also very important to understand how the GMAT uses math diagrams. You should buy the GMAT Official Guide; in this guide is a 30-page section called the “Math Review” — this lists, in relative condensed form, every math concept you need to study. Many of these individual concepts you will find explained in detail in posts on this free blog — pull down the “Quantitative” drop-down menu above this article. You should also learn some fundamental math strategies, such as number sense and how to estimate. Math is not a spectator sport: you learn and understand math only by doing it. Studying for GMAT math definitely involves practice, practice, practice. Review whatever math concepts you need to review, and for the majority of your math practice, make it mixed review — that’s what builds the understanding of math you will need on the test. Force yourself to work against a clock as much as possible —- except at the very beginning stages, deny yourself the unsustainable luxury of unlimited time. When you get practice questions wrong, as naturally will happen at any level of review, then write down in a journal what you got wrong, how you got them wrong, and what concepts you need to reinforce. Make a detailed analysis of your mistakes. We all make mistakes, but the mark of an excellent student is never making the same mistake twice. Finally, here’s a 3-month study schedule specifically designed for folks who are not jumping for joy about all the math they need to re-learn for the GMAT; you will see other study plan options in the right side-bar. The foregoing advice should set you out on the journey of studying for GMAT math. If you have any beginner’s questions about how to study GMAT math, please post them in the comment section below. Also, here are a couple free questions. 2) a DS question: Is x divisible by 12? When you submit your answer to each question, the following screen will have a complete video explanation. 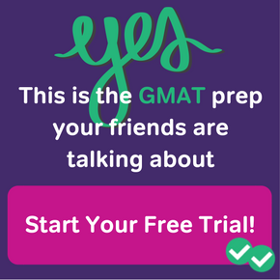 Let us know about your experiences of studying for GMAT math! I am not very good at math but ready to put in the hours. I read from your posts that practice is the only solution but where do i get these practice questions from. Everywhere i go i see one or two questions for each concept which doesn’t really help me practice the questions. Don’t want to use OG questions for practice. Please advice. I left school many years ago and I remember very little about basic math. I feel it would be best by starting off with simple math, and work up from it. Maybe the first few stages will go quickly and my memory will kick in. Your thoughts? I’m very glad you found this helpful. 🙂 My friend, I wish you tremendous good fortune in your future. I am on the verge of registering up for the premium course, had couple of doubts though. Realistically my chances of improving score from 470 to 700+ within month? I wish you the very best of luck, my friend. Congratulations! I am very excited for you! 🙂 Remember to bring the highest level of excellence to each and every aspect of your studies. Remember, you are studying to become a leader, not a follower. Don’t simply “follow” the plan: instead, move through it with initiative and determination. I wish you the very best of luck! to be sincere am always afraid of math.but i want to apply for an MBA and now must do GMAT. along the way here comes math that am always scared of… don’t know how to go about.need some help and encouragement. 3) Join Magoosh. Our math lessons and questions explanation videos are precisely what anyone needs to build up an understanding of math. 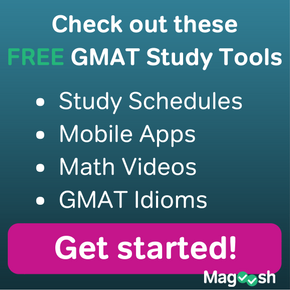 My friend, with these resources, you can meet the mathematical challenges of the GMAT! I’m happy to respond. 🙂 I wonder if you hear the contradictions in your question: “What’s the strategy for an average learner to put in average effort and get an above-average score?” In other words, “How do I put in only average input and get an above average output?” If there were an easy way to do that, everyone would do it, and then the “above average” results would become average. Anything above average is above average precisely because it hard to achieve and involves more work/focus/effort than most people want to exert. Understand that questions about achieving high goals with little time or little work or little effort are the questions of mediocrity, and they consistently lead to unimpressive results. Everyone wants to get something for nothing, and that is simply not an effective success strategy. If you want to achieve excellence, you need to adapt an attitude of excellence. “What more can I learn? How can I understand this idea more deeply? What else can I do to improve myself?” Those are examples of the questions of excellence. The reason most people don’t score over 650 or 700 is because it takes tremendous dedication and commitment to get there, and many people just want a quick fix solution, so they never get there. If you don’t have a facility with mathematics,that’s all the more reason to work as intensely as possible. First of all, you need to know all the basic math inside out — every formula, every geometric theorem, every counting scenario, etc. etc. 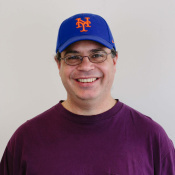 It would help tremendously to read every Quant article on this blog. Those will help you with the basic formulas & facts. Drill those flashcards until you know every single one without a doubt. Finally, the most important thing is practice, practice, practice. You learn math by doing it. When you make mistakes, learn from them thoroughly — the mark of an exceptional student is: never make the same mistake twice. That’s a high ideal: it’s hard to live by that 100%, but the closer you come to that ideal, the faster you will progress. You need to read problem solutions & explanations — you have to understand how people who are good at math view problems, and you have to learn to look at problems with that same perspective. These are all things that can help you, but they take time & effort & dedication & commitment. If you can bring all of those to your GMAT preparations, you will maximize your chances of performing at your very best. Very helpful article. Though I was a math student, still facing challenges in dealing with math, may be because it’s been 14 years when I left math. Can you please answer below questions? 1. How important is to memorize the formulas and basis concept? 2. I am good when learning new formulas/rules, but forget/having hard time to recall them when start learning and practicing new ones. What should I do ? It’s certain true, on the GMAT, that you have to have a number of formulas at your fingertips, to solve the easy & medium problems efficiently. It’s also true that the harder math problems will try to trip up people who just blindly memorize formulas. So, it’s important to know them, but not just in a memorized way — it’s important to understand them deeply. You may have to drill yourself on an individual formula 10 or 20 times before you really know it cold, but that’s the goal — knowing each one inside-out, with no hesitation or uncertainty. Thanks for your insight, i am so nervous thinking how to even start preparing for gmat when i haven’t studied maths in my higher grades,being a medico its tough to start from the basics yet i am very keen in doing MBA after my dental grad. You are quite welcome. Have courage, my friend. In order to get better, you need to jump in — practice every day! Do mental math (addition, subtraction, multiplication, and division) every day. Look for opportunities to do math in daily life. You can do this! Have confidence!